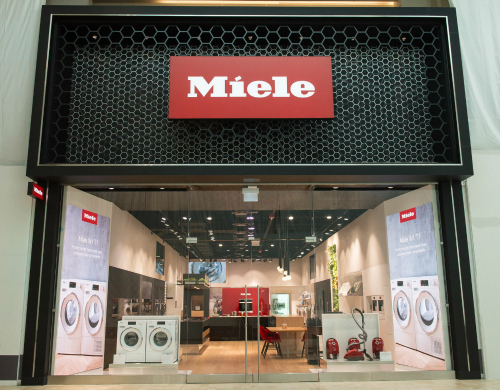 TORONTO – Miele Canada has opened its fifth Experience Centre in Canada, but the first in a premium shopping centre and the first to offer consumers its new retail concept and design, which is focused on allowing shoppers to experience the major appliance brand with all of the senses. The company said the concept is relatively simple: digital first while remaining human at heart. This most modern Miele Experience Centre will rely on a combination of digital elements, product experience and expert advice. Visitors will be welcome to try out the appliances on display and discover the user benefits they offer. From laundry and floorcare appliances to kitchen products through to Smart Home, all Miele product categories are represented. This is a full retail store where customers can purchase all products. The heart and soul of the new store is the active kitchen area. Cooking and baking demonstrations take place several times a day. Freshly prepared culinary treats from croissants to homemade soups can be sampled by customers during their visit. The lounge area adjacent to the kitchen is an invitation to linger and enjoy the atmosphere. In terms of store design, Miele relies on warm and natural materials which exude a homelike feel. The lighting and ambient videos on five screens in the store change to reflect the time of day. Various digital elements further induce interaction with products or provide additional information. At the new Swiping Cooktop Screen, it is possible, for example to perform virtual cooking and to experiment with the various Miele induction cooktops on display. The 46-inch touch screen display on the M-Touch Wall shows the product range with the eponymous technology in full size and illustrates the function of the controls which simplify the operation of numerous built-in appliances. Also new is the Miele CareCollection Consumables Wall. With the aid of short videos, this feature informs visitors about the various Miele cleaning and care products. Videos are launched by scanning items using the NFC scanner provided. Whilst the four other Miele Experience Centres in Canada – located in Calgary, Montreal, Toronto and Vancouver – offer large-scale showrooms in edge-of-town locations, the new store is the brand’s first location in a well-frequented premium shopping mall. “We are extremely excited about our partnership with Yorkdale Shopping Centre and believe that this new location will make the Miele brand even more accessible to even more consumers,” Dalcourt said. The Yorkdale Shopping Centre has approximately 18 million visitors per year and is home to several high-end furniture and home and home furnishing retailers including RH, Crate & Barrel, Pottery Barn and Williams-Sonoma, among others. Dalcourt also said the new endeavour demonstrates Miele’s commitment to the Canadian market where demand for its world-leading, premium appliances continues to grow.